I have always been somewhat deathly afraid to try my hand at making a layered cake. I have made most other types of desserts since my interest in cooking and baking began however there always seemed to be an aura of mystery about the layered cake. I did once attempt to make a layer cake with raspberries and some type of vanilla cream when I was about 9 for my dad’s birthday. That turned out disastrous. I was too anxious and took the cake out of the pan before it had cooled so it didn’t come out as perfectly as it probably could have… it was broken and cracked all over. I didn’t shave off the top so it had those cake tops . I tried frosting and placing the raspberries in the middle even after this so the heat caused the cream to melt and the berries to ooze its juices. My father is a simple man and me just even attempting to make a cake for him was a great present already. He ate my cake and said it tasted great. Even though he complimented it I was still embarrassed at how it looked. So it took me more than a decade to once again try my hand at making a layered cake. Ever since I tried one of Elizabethan Desserts wonderful cakes… I became inspired that great cakes didn’t have to look like the ones at Extraordinary Desserts. I scoured epicurious.com for various recipes that I could use and adapt to the flavors I really liked in the cake that I had tried. These original recipes can be found at http://www.epicurious.com/recipes/food/views/108258 and http://www.epicurious.com/recipes/food/views/5378. Below is the recipe I adapted from the two pages I found. Preheat oven to 350°F. Butter and flour two 9-inch round cake pans with 2-inch-high sides. Stir white chocolate in top of double boiler set over barely simmering water until melted and smooth. Leave white chocolate in pot; turn off heat. Sift flour, baking powder, and salt into medium bowl. Using electric mixer, beat butter and sugar in large bowl until well blended. Add eggs 1 at a time, beating well after each addition. Beat in vanilla. Add dry ingredients alternately with milk in 3 additions, blending well after each addition. Add warm white chocolate and beat just until blended. Divide batter equally between pans, smoothing tops with spatula. Bake cakes until tester inserted into centers comes out clean, about 30 minutes. Cool cakes in pans on racks 20 minutes (cakes will fall). Run small sharp knife around cake pan sides. Turn cakes right side up onto racks and cool completely. Using electric mixer, beat butter in large bowl until fluffy. Beat in chopped strawberries and vanilla, scraping down sides of bowl occasionally. Beat in powdered sugar. Cover and refrigerate until thick enough to spread. Beat cream cheese, butter and vanilla in large bowl until light and fluffy. Gradually beat in sugar. Cover and refrigerate until firm enough to spread, about 15 minutes. Boil 1/2 cup rum and sugar in small saucepan over medium heat, stirring to dissolve sugar and until alcohol is gone. Cool syrup. Slice the remaining strawberries to place in the layers and on top. 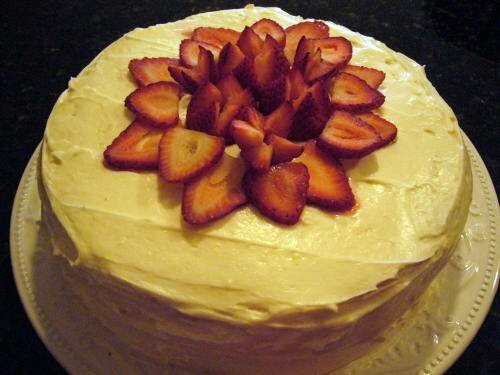 With a serrated knife, shave the top of both cakes off so there is a flat surface to frost and decorate.